Google Alerts notified me of this very interesting blog post. Click on the link to see what Sisoes’ reaction to the tomb was. I had not heard of St Sisoes before so I don’t know if he is a historical figure or a legendary one or – assuming that the former is the case – whether he really did visit Alexander’s tomb. If, as it appears, the icon was a direct reaction to the loss of the Byzantine empire, I imagine that the event depicted has no basis in reality but it really doesn’t matter either way – the icon’s messages is valid whichever way you look at it. 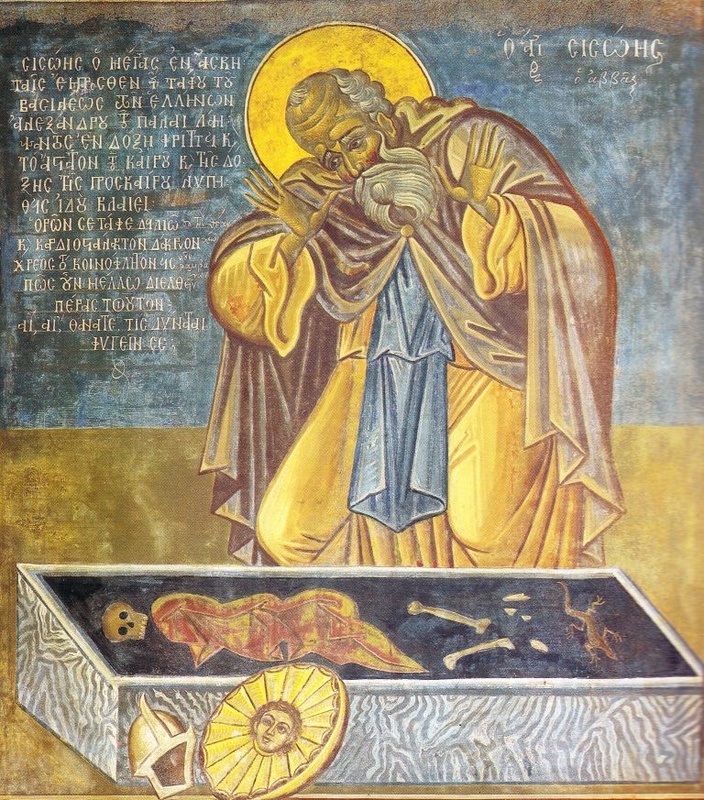 The icon of St Sisoes at Alexander’s tomb is the first iconic reference I have seen to Alexander in Orthodox Christianity. He is the second Orthodox Saint I have seen mention the Macedonian king. The first is St John Chrysostom who asked where the tomb was. Chrysostom aside, I wonder if any Catholic Saint ever mentioned or is depicted visiting the Soma in Alexandria? I saw other icons on this subject, but this one struck me because there are some details that are different, ie. Alexander’s body isn’t a mummy but only a skull and some (leg) bones. On the contrary, there is a royal mantle and, outside the coffin, an helmet and a shield with a radiant head in the middle, so similar, strangely, to the Macedonian Sun. It means therefore that there are many traditions about St.Sisoes and his visit to Alexander tombs, and I wonder which of them is more credible and whether there is one of these traditions credible. I think the fact that only Alexander’s skeleton is shown shows the artist’s attention to the moral that the story is trying to get across. An embalmed body is, of course, a dead body but it doesn’t look like one. It looks like the person is simply asleep. The presence of a skull and some bones, however, leaves one in no doubt: death has taken this person (and it will one day take me), which is what the moral of the story is. The royal mantle and helmet obviously point to what Alexander was – a king and general. The shield is interesting. As you say, it has the Macedonian sun rays on it but also the head. I wonder if the artist was influenced by Alexander’s armour which featured Medusa on it. I hope I can find out more about St Sisoes and this tradition of him visiting the Soma. As a lifelong Orthodox Christian myself, I will say that I have never known any doubt as to the actual life of St. Sisoës. The story of his deathbed repentance (which, I am happy to see, is described in the linked post) is an often enough told one in Orthodoxy and with good reason. I myself, although I have Orthodox patron saints, grew up with more of Alexander the Great than of my Orthodox patrons Alexander, but this perhaps owes itself to my Greek mother and her northern Greek heritage. Thank you for your comment. Sisoes’ act of repentance is a wonderful moment. I wonder if your mother is Macedonian? She was indeed. She was born in a little village near Thessaloniki. She thought very highly of Alexander, and she told me about him and gave me books to learn about him as a boy. P.S. : on the subject of historical doubts, there are, on the other hand, questions about the event in the icon actually took place. I’ve just never known his actually having lived to be doubted. Thank you for that link; I’ll certainly take a look at it. The presentation of the St. Sissoes is most identical but the full skeleton of Alexander is shown and no Macedonian shield. I wonder if the narrative on the icons is the same. That’s very interesting. Unless the picture has been cropped, I’d say the artist must have thought the words would be enough to make the identification of the skeleton with Alexander. Thank you for the link. Reblogged this on ORTHODOX CHRISTIAN SPIRITUAL FORCE + + + + Faith Is Power & Truth Is Beauty + + + by Andreas C Koutsoudis.